1)	Source an old 35mm film camera. 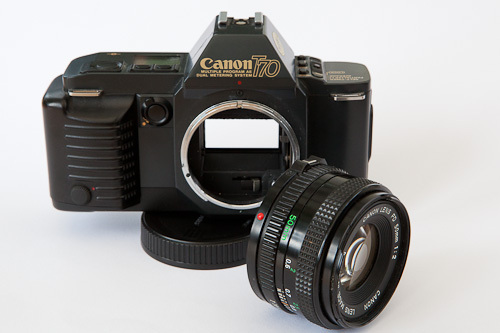 I was given an old legendary Canon T70 which wasn’t working so I used that. You ideally want a lens with a large aperture so the final projector is efficient with the light you shine through it. Too slow a lens will eat the power of your flash. Prime lenses are best for this and were a lot more common back in the day so are relatively cheap. I used a 50mm lens but am on the lookout for a wider lens to give a bigger projection. 2)	Remove the back door of the camera. As mentioned above there’s no need to be shy about this. Simple get hold of the door and snap it off. Once removed a pair of pliers can be used to snap off any hinges. You might be lucky and find a donor camera with some screws you can remove to get the door off. 3)	Next you need to remove the shutter curtain and mirror. I found it best to do this with the lens off. That way you can get to it from both sides. 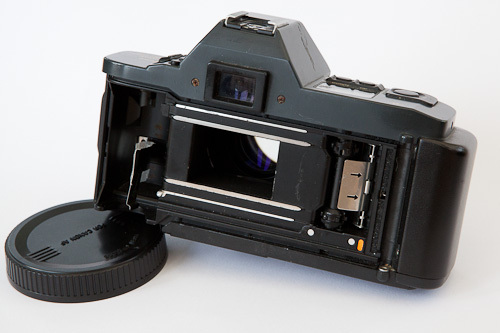 This is one step that might be best to be done by taking the camera apart as you need to make sure the “window” you are left with doesn’t have any pieces of curtain protruding from edges. I used a pair of pliers and simply ripped the mirror and curtain out. Not pretty but it worked. 4)	You should now have a camera body with no back and a big hole in the middle. 5)	Reattaching the lens you can look through the back and see the world upside down. 6)	The next step is to create your slide. The first time I used a piece of tracing paper which I carefully drew a grid on using a soft black pencil. Remember your drawing is going to be magnified hugely so any mistakes WILL show up. Ideally you want to be printing your slides on overhead transparency film. Create yourself a file in Photoshop which contains lots of rectangles on it, within which you can draw your images that you want to project. 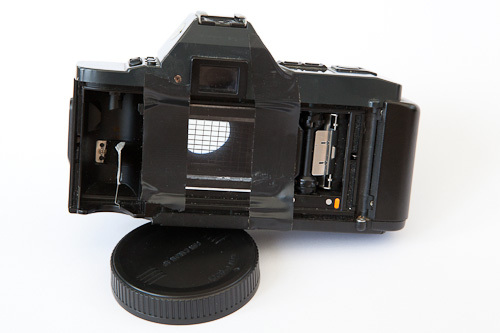 A film negative is 36x24mm in size. To be on the safe size I created the rectangles 34x22mm in dimension. 7)	Once you have printed your transparency you need to cut the slides out. Leave a border around the rectangle which is beg enough so you can attach it over the shutter window with tape but small enough so it lies flush to the back of the camera. 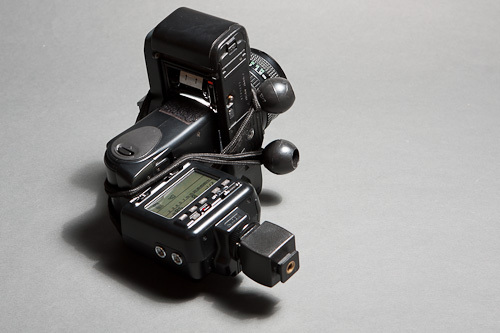 8)	Finally to finish construction, you need to attach your strobe to the back of the camera. By twisting the head so it is 90 degrees to the body this is simple enough to do with a couple of ball bungees. 9)	The great thing is you can mount your camera projector onto a tripod or light stand using the tripod mount on the bottom of the camera. I used a Manfrotto 026 umbrella adapter on the top of a light stand. 10)	Ensuring the widest aperture aim your camera at a wall and attach your flash triggers. Take a test shot of the wall and see your slide magnified and projected onto the wall. A note on focusing. With the slides I was using a bit of blur was actually beneficial in the effect I wanted to create, but you might want to ensure your projection is nice and crisp by focusing your projector on the wall. This can be done by trial and error or measuring the distance from camera to wall and setting accordingly on the lens. You will notice that your test shot will give a very hard light. With very crisp lines and dependant on the ambient light in the room very black shadows. I wanted to soften my projection so I added an umbrella directly behind the projector to fill in the shadows and create a soft light. Simply ensure the power of the flash into the umbrella doesn’t over power the projector and completely obliterate the projection. Richard C Hill is a photographer based in Milton Keynes. Shooting many forms of portrait photography from fashion and beauty images through to relaxed portraiture and dynamic sports images. You can follow his writings here. P.S. Looking to create cool backgrounds? Check out our Bokeh Masters Kit, your friendly background changer. I know this is about a projector, not the models you used to share your DIY, but I feel like it is important to note (because this is a huge problem for women, girls, and their self-esteem, to see girls like this glorified when in fact they’re truly unhealthy) that unlike Impressive, I think the redhead model could use a more nutritious diet, she’s a tad on the grossly anorexic side. Curves look much nicer than bones. The blonde is better, but her expression is nearly as creepy as the other girl’s protruding bones. wtf? Maybe not healthy, but still her own choice, no? You need to stop fitshaming women. They made the choice to be thin. Show them some respect and stop trying to make them ashamed of their looks. not as strong a light as a flash perhaps so its easily washed out.